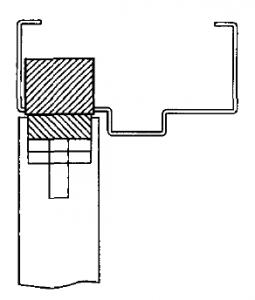 Electromagnetic locks are locks that have two main pieces: the armature that is mounted to the door and the magnetic lock assembly that is mounted to the frame. Electromagnetic locks are often called Magnetic Locks or even just “Mag Locks”. These locks are electrically powered and are usually connected to an access control system and receive signals from other hardware such as motion sensors, request to exit switches, or credential readers. These are commonly paired with exit devices that have built-in signal switches that tie into the mag locks. Magnetic locks are supplied fail safe, meaning that when power is cut the device will remain unlocked. This also means power must be continuously supplied in order for the mag lock to stay locked. Electromagnetic locks are often supplied with the option to be 12 or 24V and can be field selected. Some mag locks allow for AC or DC power. Once engaged, many mag locks will hold the door secure with hundreds of pounds of holding force. Some locations may be ideal for higher holding force than others. Mag locks can be used on fire rated openings as long as they are tied into the fire alarm system and are programmed to disengage upon alarm activation. This allows for free egress when the power is dropped. NOTE: These locks do not replace the latching hardware required for fire rated openings. Lower security doors can have mag locks with holding force anywhere from 500 to 1,000 lbs. and are ideal on interior wood doors and aluminum doors. Higher security doors can have 1,000 to 3,000 lbs. 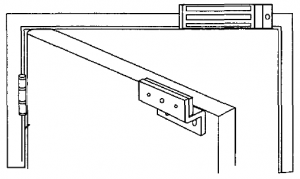 of holding force are are recommended for use on heavier gauge hollow metal doors and frames. Surface mounted magnetic locks are the most common magnetic locks. They can be mounted to the header of the frame on single and double door openings or to the strike jamb on single door openings. Surface mounted mag locks are ideally mounted on the push side of the opening, although there are options for mounting the magnetic locks on the pull side. 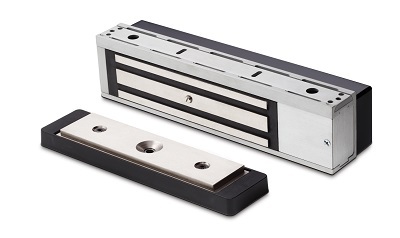 Surface mounted magnetic locks can have housings that range in size and can come in some of the most common finishes. Mag locks are generally recommended for indoor use, but can be used on exterior openings but will require more maintenance when installed outside. Concealed mounted magnetic locks are concealed in both the door and the frame. These mag locks are often called “Shear Locks” because they are mounted differently than surface mounted mag locks. 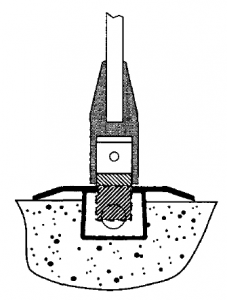 The pull force is in a “shear” direction instead of a direct pull. They can be mounted inside the frame and door or at the bottom of the door and in the floor. Shear locks require a minimum distance between them so take additional consideration when prepping the opening for these kinds of locks, especially when mounted in the floor. They tie into the same types of access control systems and connect to similar hardware like the surface mounted mag locks. Whichever mag lock you choose, be sure to think through the whole operation of the opening. Think about how it will operate when power is supplied and when power is cut off. If the only hardware on the opening that is holding the doors secure is the magnetic lock then you may have some serious security problems. If the power drops unexpectedly, and without additional locking/latching hardware, the door will be left ajar and anyone will be able to gain access through that opening. If you have questions about a system setup or need help identifying requirements for your project, please contact a sales representative today at Beacon Commercial Door & Lock to get the answers you need.